Three former ministers have been suspended from the Parliamentary Labour Party "for bringing it into disrepute". Stephen Byers, Patricia Hewitt and Geoff Hoon are under investigation over their apparent willingness to help a lobbying firm in return for cash. They were secretly filmed by the Channel 4 programme Dispatches, but have denied any wrong-doing. Tory leader David Cameron said people were "disgusted" and Justice Secretary Jack Straw said MPs felt "anger". The decision to suspend them was taken after Dispatches showed undercover footage of various politicians who were approached by a fictional US firm looking to hire them for lobbying work. A source told the BBC that the Commons Standards Committee had approved Mr Byers' own request for an inquiry into his actions. Parliament's standards commissioner has also been asked to look at complaints against Mr Hoon and Ms Hewitt. Mr Straw told BBC Radio 4's Today programme that Labour was carrying out its own investigation into the three former ministers. He added that their suspension had "nothing" to do with their allegiance to former Prime Minister Tony Blair. Blairite anger over their actions was "as strong, if not stronger than [among] those in the past who were on a different wing of the party". Prime Minister Gordon Brown has dismissed Conservative calls for an inquiry into the alleged actions of officials and serving ministers. Mr Straw said there was "not a shred of evidence, not a single scintilla of evidence" they had done anything wrong. "There's anger... and incredulity about their stupidity... getting suckered by a sting like this." Labour rules allow those who bring the party into disrepute to be punished. Mr Hoon said Mr Brown had told him his unpaid work with Nato, on the prime minister's behalf, would now cease. Mr Cameron, speaking at his monthly press conference, said: "Anyone who watched the Dispatches programme last night could not help but be, frankly, disgusted by what they saw. He added: "We need a proper [government] inquiry into all of this." Chairman of the committee on standards in public life, Sir Christopher Kelly, said he had been "greatly saddened" by the Dispatches programme and "the further damage that will do to people's perception of members of Parliament". He said rules banning paid-for advocacy in the Commons were "quite clear" and what was required was "proper enforcement and proper sanctions when misbehaviour occurs". "In all of this what's really required is changes in behaviour, it requires a culture in which the principles of public life, selflessness, integrity and so on, are embedded in the behaviour of those who hold public office." Three other politicians were featured in the programme - Labour MP Margaret Moran, Labour's Baroness Sally Morgan and Conservative MP John Butterfill. It is understood that Mr Butterfill has referred himself to the standards commissioner and Baroness Morgan has already referred herself to the sub-committee on Lords' interests. Ms Moran, already deselected by Labour as an election candidate following revelations over her expenses, has been suspended by the Parliamentary Labour Party. 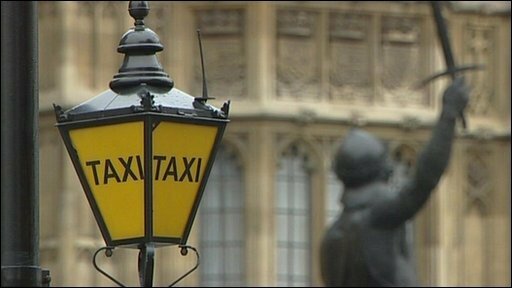 Under Commons rules MPs can work for companies, but must declare payments and may not lobby ministers directly. Mr Byers, a former transport secretary, was filmed saying he was like a "cab for hire" who would work for up to £5,000 a day and claimed to have saved millions of pounds for National Express, which wanted to get out of its East Coast mainline franchise. Transport Secretary Lord Adonis told peers on Monday there was "no truth" in claims he came to "any arrangement", dismissing the comments as "pure fantasy". Mr Byers also said he had spoken to Business Secretary Lord Mandelson about getting food labelling proposals delayed, on behalf of supermarket Tesco. The business department, Tesco and National Express denied the claims - and Mr Byers said later he had overstated his case and had never lobbied ministers. 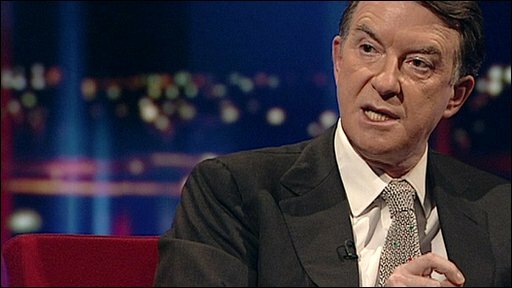 Lord Mandelson told the BBC had had no contact with Mr Byers about food labelling and said it was "rather grubby" that the MP had made "completely untrue, unfounded boasts... in order to get himself future business". Former Defence Secretary Mr Hoon was filmed by Dispatches saying he wanted to make use of his international knowledge and contacts in a way that "makes money" and that he charged £3,000 a day. Mr Hoon has said he had made clear that he would not lobby government or "attempt to sell confidential or privileged information arising from my time in government". Ms Hewitt, a former health secretary, said she "completely rejected" the suggestion she helped obtain a key seat on a government advisory group for a client paying her £3,000 a day. BBC political editor Nick Robinson said the three former ministers were not popular among Mr Brown's team - Mr Hoon and Ms Hewitt tried to lead a coup against his leadership in January. All three are due to stand down as MPs at the next election. Cameron: 'We need to see the minutes"